Late night tapas, day-long sunsets descending over sparkling blue coastlines, Gothic city skylines with the unmistakable spires of La Sagrada Familia spearing the horizon. Barcelona is the city that has everything. The glittering jewel tones of the beach, the hustle and bustle of La Ramblas, the bistros serving wine and tapas, and criss-crossing rows of small streets lined with shops and bars fill the gaps between the delightful lines, shapes, and colourful tiled mosaics of Barcelona. Gaudi’s city. With more than a dozen architectural masterpieces, including the unfinished La Sagrada Familia that started construction in 1882, Spain’s foremost architect Antoni Gaudi, scattered love letters in the form of modern design across his city. Projected to be complete by 2026, La Sagrada Familia is one of the greatest artworks of all time with towering Gothic facades and spires, columns that resemble tree canopies, and a surreal art nouveau crucifix suspended mid-air. Casa Batllo (House of Bones), like all of Gaudi’s work, was inspired by nature. Doorframes resemble eddies of water, bone-shaped columns have flowers growing out of them, and stained glass windows fracture sunlight off the blue and turquoise stone walls. Barcelona is a modern city that will delight you with stories of facades (and facades with stories), a celebrated food scene, a mild Mediterranean climate, flamenco, and, of course, football. Barcelona is the city that has everything. Travelling to Barcelona? 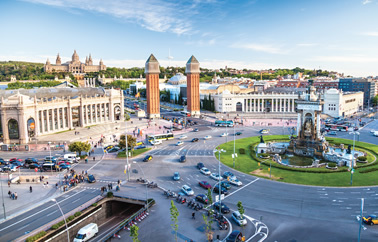 Air Canada, via Air Canada Rouge, and Air Transat fly direct into Barcelona nonstop during peak season from Toronto and Montreal (about an eight-hour flight). For all other major Canadian gateways, Air Canada provides an option to add on a connecting flight - our recommended option for all-around comfort, quality, and flexibility. If you want to fly direct to Barcelona, we can help you get there. Enquire online for more details (see above), over the phone at 1-877-967-5302, or visit us at your nearest Flight Centre store. When you’re planning your trip to Barcelona, consider the high, low, and shoulder seasons. 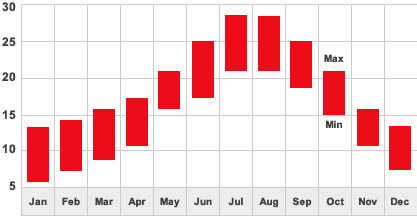 Generally, the warmer and more mild the time of year it is, the more crowded and more expensive it gets. July and August are considered peak tourist season months for Barcelona travel - and also the hottest. Visiting Barcelona during June or September, the shoulder season, means milder temperatures and less crowds. World renowned gastronomy, museums of Picassos and Dalis, an amusement park of modern architecture, striking rhythms of flamenco, sprawling seaside beach towns, diverse shops of international brands and one-of-a-kind boutiques - Barcelona has it all. While these are just a few Barcelona highlights, here are our top five must-sees to add to your Barcelona travel guide. Barcelona's most famous street is both a pedestrian boulevard and a window into Catalan culture. Inspiring awe by its sheer verticality, it’s still under construction after more than 100 years. This show reveals the variety of music, singing and dancing incorporated in this passionate art form. Barcelona has a celebrated food scene fuelled by a combination of world-class chefs. Attending a game amid the roar of the crowds is an unforgettable experience.